New for 2014, the Ridley Fenix alloy frameset which have the same features of its carbon fiber big brother but at a lower price point with Triple-Butted Hydroformed 7005-T6 aluminum tubes with flat section seatstays engineered to offer comfort enhancing vertical compliance and lateral stiffness. Sharp Edge design tubes for improved stiffness and impact resistance & tapered headtube for increased front end stiffness for optimal steerer precision. Available in Black or White. Sold as a frameset only. Optional parts shown. Lotto Belisol Pro Cycling Team Top Sprinter - Andre "The Gorilla" Greipel - sprinting his way to 2nd place for the battle of the Green (Points) Jersey on the 2013 Tour de France. 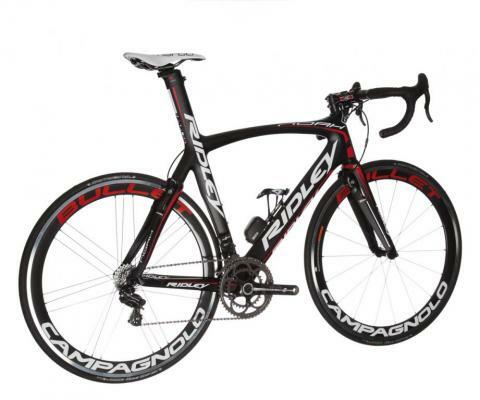 Ridley Bikes from Belgium powers the Belgian based Lotto Belisol Pro Cycling Team, have two different road bikes for each of the riders' preference - the new lightweight Ridley Helium SL or the slippery - aerodynamic - stiff Ridley Noah Fast. Due to the unique design, the Fenix is a multi purpose frame that can be used for recreational and competitive riding. The oversized sharp edge tubing guarantees a high level of stiffness and is extremely strong in all areas. The specially developed flex areas in the seat stays absorb vibrations from the road to give the rider the right amount of comfort. This is a true all-rounder! The Noah incorporates 2 of our FAST-Concept technologies. These combined technologies offer up to 2km/h advantage in the sprint and up to 15 watts less power input needed to average a 40km/h breakaway. Superlight race bike, approximate weight: 750g. The oversized tube shape is engineered with the use of extremely high modulus carbon. This results in a very light frame, without compromising stiffness. The dual purpose internal cable routing uses the same holes for mechanical and electronic shifting, resulting in a very clean design without excess holes. Flex seat stays increase vertical compliance for additional comfort, without reducing lateral stiffness. The first bike with a “real” integrated brake, our F-Brake. The Noah FB incorporates all of our FAST-Concept technologies. These combined technologies offer up to 2.8km/h advantage in the sprint, and up to 20 watts less power input needed to average a 40km/h breakaway. The Noah FB is the ultimate frame in the Word Tour peloton, no compromise, just pure speed. 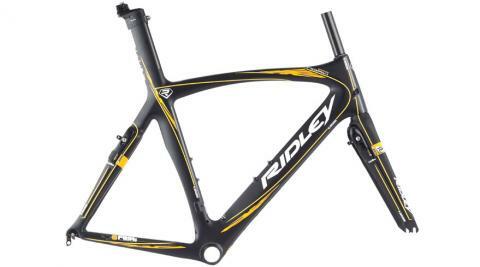 To celebrate the launch of their 2013 Helium SL frameset Ridley have created a special edition - the Helium SL Limited 58. Called the 58 because the bike weighs only 5.8kg with pedals & will be sold as a limited edition of 58 bikes with each frame being numbered. The first bike with a “real” integrated brake, our F-Brake. The Noah FB incorporates all of our FAST-Concept technologies. These combined technologies offer up to 2.8km/h advantage in the sprint and up to 20 watts less power input needed to average a 40km/h breakaway. The Noah FB is the ultimate frame in the Word Tour peloton, no compromise, just pure speed.